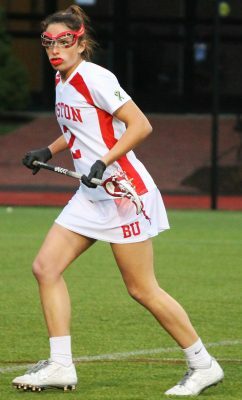 The last time the Boston University women’s lacrosse team played Lafayette College, offense was the name of the game for both sides. Senior goalie Caroline Meegan (18 saves) and junior attacker Avery Donahoe (6 goals, 7 points) had career days for the Terriers (10-7, 6-3 Patriot League) as their 20-16 victory on April 8 marked the team’s highest scoring output since their 21-12 thrashing of Binghamton University on April 13, 2013. On Wednesday afternoon at Nickerson Field, it appeared that another powerful offensive display from the two teams was unlikely. When BU took on the Leopards (10-8, 5-4 Patriot League) in the latter’s first playoff appearance since 2013, rhythm was hard to find in the game’s early stages. Each team took four shots in the opening six minutes of play, but they still were searching for that first breakthrough. Then, in a 25-second stretch, goals by senior attacker Elisabeth Jayne and junior attacker Mickenzie Larivee followed, and the contest began to open up little by little. After Lafayette star and Patriot League Attacker of the Year Kirsten Wilhelmsen brought her league-leading goals total to 67 following her four-goal first half to give her side the 5-4 lead, BU used its offensive versatility to regain momentum. Consecutive goals from Jayne just 40 seconds apart helped the Terriers regain the 6-5 advantage, and after sophomore midfielder Kaitlin Belval’s strike with 1:10 remaining in the half, they found themselves up 7-5 going into halftime. As much of a gem as Wilhelmsen is for the Leopards, she couldn’t do everything, especially when not on the field. Early into the second half, the Wallingford, Pennsylvania native took a tumble in BU territory, and was ruled out for the rest of the contest. Watching the league’s top scorer and points getter this season (90 points) was disappointing sight to see, especially for a Lafayette side that relies heavily on their star player’s offensive wizardry. After a goal from Leopard Emily Wingate trimmed the Terriers lead to 7-6, the home side took advantage of its depth to seal the game. With just one second remaining on the shot clock, Belval streaked down into the Lafayette box, received a pass from senior attacker Taylor Hardison and slotted it by goalie Anna Raymond for the 8-6 cushion with 22:08 remaining. Belval’s second goal of the contest began what was a game-sealing 5-0 run for BU, as it saw more strikes from her, Donahoe, Larivee and sophomore attacker Catherine McAuley. Lafayette’s Emma Novick (45 goals and 59 points, third-best on team) added a goal with 8:24 left to trim its deficit to 12-7, but there would be no comeback tale. Belval finished off another pass from Hardison with 7:00 remaining to cap off a career-best four-goal performance, while Jayne’s conversion at the 1:18 mark helped seal the decisive 14-7 victory and BU’s semifinal spot in the Patriot League tournament for a fourth straight year since moving to the league in 2013. Five different Terriers scored, as Jayne joined Belval with four goals and was followed by Larivee, Donahoe and McAuley. BU finished the game outshooting the Leopards 43-25 (30-17 shots on goal), and winning the ground ball (24-14) and draw control (16-7) battles, signs that Robertshaw’s side was aggressive offensively. Maximizing her player’s talents in postseason play is something Robertshaw needs to do, but with the offensive depth her team has displayed during this five-match winning streak, everyone seems to be rising to the occasion. “If someone’s going to try to shut out Kailey or if Taylor’s not going to have a great game like she did today, we need people to step up and they know that and I feel like you saw it,” Robertshaw said.